Hi, Kaffe Matthews here, that Sonic Armchair making girl you helped so much, do you remember? Audiocar said that this was where I would find you, and if you don’t want to have anything to do with what I am asking, then fair enough. 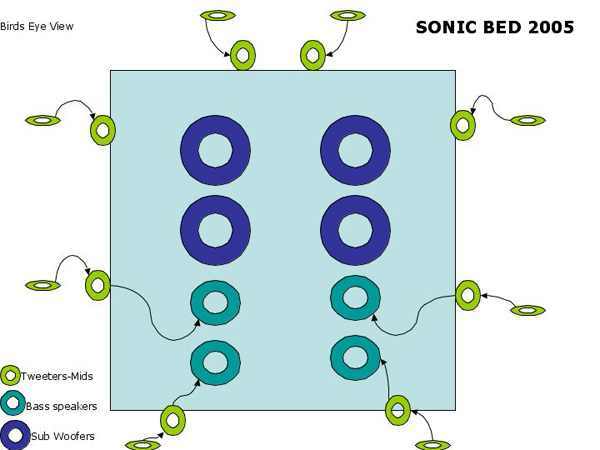 Suffice to say that I have a problem concerning the design and build of a Sonic Bed (king size) and could really do with the best advice, which you certainly gave me before. If this is not in your interest any more, please could you pass this on, or pass me a phone number /address/company I could contact? 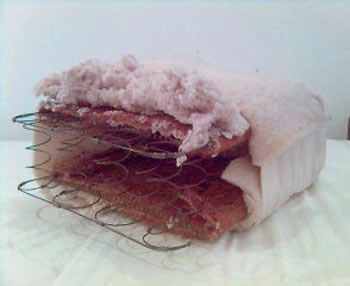 I am now based in East Hackney , E8. Anyway, one of my reasons for making a bed(king size) as opposed to another chair is that there a Bed provides a large space in which to put sub woofas, and obviously a large surface area for bodies to lie in contact with them. Do you remember the trouble we had getting speakers in an armchair? However, I am also wanting to have a spread of tweeters and mids under the person lying, so, if I had 4 subwoofa cabinets under the mattress, in the bed frame, yes someone lying would get the bass vibrations, but if then on top of those, I had a wooden frame a range of tweeters and mid bass, what would happen to their vibrations? The music playing and communicating by vibration to the resting body is the essential thing of course, but I am really needing advice as to the best way to achieve this. Put simply, would a horizontal frame with tweeters and mids nesting in it (covered with a thin mattress with holes cut, but a mesh placed over the speakers diaphragms for protection) underneath which are 2 to 4 subs playing their own thing, do the job, or would vibrations of the subs under the horizontal grid of speakers get lost? The subs would need to be each in their own sealed cabinets (do you remember, we had the woofers facing the floor in the sonic armchairs) and then the rack separate above that. How would the sub vibrations contact the body if the body is not directly lying on them? Are car speakers the best way forward for the surface frame? This structure has to be comfortable and strong and not feel like lying on speakers! FINAL THOUGHT: should i be doing this with hi fi speakers?? as i do have the space for speaker cabinets?, Important thought is that I will be working extensively with bass and sub bass frequencies… what do you think? So many thanks for any advice, knowledge and inspiration on this Gary. I look forward to hearing from you as soon as possible.